L ig ht we ig ht cotton fr oc k in s ha pe o f a wi gg le d re ss f ro m th e fi ft ie s / si xt ie s. By local de si gn l ab el “ Re vi ew ” dr es s fa br ic i s re mi ni sc en t of H aw ai ia n t re nd with its la rg e tr op ic al bursts in g re en s an d ye ll ow L ov el y wi de belt bu t I a ls o li ke t he r us ti c le at he r.
Socks with great soles! Features delicious cupcakes and treats on the top With TEA TIME on the bottom to show you're ready for a break Product Specifications: Approx. Dimensions (Packaging): 2 (H) x 8 (W) x 20 (D) cm / 0.8 (H) x 3.2 (W) x 8 (D) inches. Brand new 1940s ankle socks. Wearable and in excellent condition. The elasticity is not perished. Size 5 6 7 in modern UK sizing. 10" long. Hats and gloves are small. Vintage 1940s Pearlustra Brinylon navy Blue Ankle Socks size 4 5 6 9" 8"
Brand new 1940s ankle socks. Wearable and in excellent condition. The elasticity is not perished. Size 4 5 6 in modern UK sizing. L@@k A Pair Of Deadstock Original Vintage 1980s Ladies Pink Fluffy Socks New!!! Officially Licensed Ladies Wonder Woman Warrior Knee High Socks. All sheer 40 den doble cover Lycra support tights. Full boarded, flat seams and cotton gusset. WEIGHT 0 KG 200 GR. Vintage Mary Quant Fancy Tights Horizontal Hold Colour Black ( Grey horizontal stripe pattern ) One Size - Regular Material 100% Nylon Made In Italy If you have any questions please feel free to contact me. Thank you! A pair of pretty blue socks. Unsure of mix but I'd guess at wool/acrylic mix. Never worn still stitched together. Grab a piece of the past! Official DC Comics Retro Wonder Woman Assorted Character Logo Socks Set x2 Pairs. Socks with great soles! Features Queen Mum graphics on the front And OFF DUTY on the bottom to show when you've finished your royal duties for the day Product Specifications: Approx. Dimensions (Packaging): 2 (H) x 8 (W) x 18 (D) cm / 0.8 (H) x 3.2 (W) x 7.2 (D) inches. Officially Licensed Suicide Squad Property of the Joker Knee High Socks. Stretch Tights/Knee High Socks. Bright Yellow. Be sure to add us to your favourites list ! 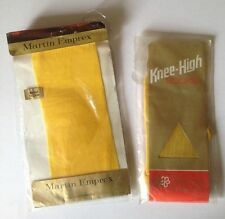 A pair of super comfy pretty beige/cream original French made 1970s socks. Size; small ladies / Girls or boys size EU35-38 UK 2-4. A pair of super comfy, nicely textured breathable dark blue original French made 1970s socks. 45/55 polyamide/cotton high quality Socks. Never worn still stitched together with original labels. =========================================. A pair of pretty bright orange Du Parc socks. Never worn still stitched together with original labels. Grab a piece of the past! A pair of pretty bright blue original Du Parc socks. Gorgeous with labels still attached. Never worn still stitched together with original labels. Grab a piece of the past! A pair of super comfy, nicely textured breathable dark blue original French made 1970s socks. 45/55 polyamide/cotton high quality Socks. Size; small ladies / Girls or boys EU31-34 UK13-3. Never worn still stitched together with original labels. Never worn still stitched together. Grab a piece of the past! A pair of super comfy pretty beige/cream original French made 1970s socks. Size; small ladies / Girls or boys size EU27-30UK10-12. Never worn still stitched together with original labels. A pair of super comfy ladies pretty beige/cream original French made 1970s socks. 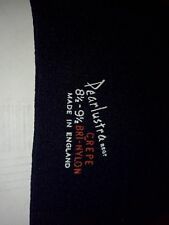 70% finest fil d'ecosse cotton 30% Polyamide. These are so comfortable you'll feel like your walking on air & they looks so good too. UK 12-2 approx.